Traditional machine vision imaging had been dominated by the CCD technology. CMOS was used either in simple inspections or very specialize applications that usually uses rolling shutters. The CMV4000 image sensor introduced by CMOSIS changes the believe that CMOS sensors are low in dynamic range and noisy. CMV4000 is a highly sensitive global shutter CMOS image sensor with pixel size of 5um and a resolution of 2048 x 2048. 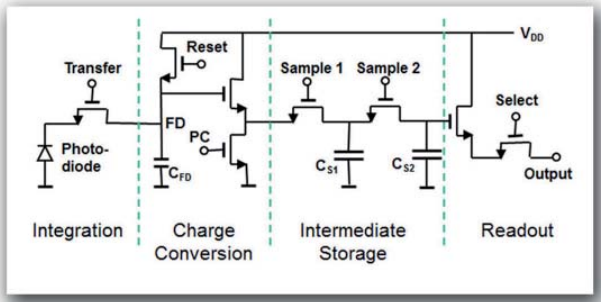 Based on an eight transistor pixel architecture, its state of the art correlated double sampling (CDS) reduces the dark current noise and fixed pattern noise. It is high speed, with 16LVDS output @ 480Mhz, this equates to about 180 frame per seconds at full frame rate. At about 60dB, its dynamic range tails tightly behind the high end CCD sensor. There is no doubt that CMOSIS have set a new bar for the imaging industry.